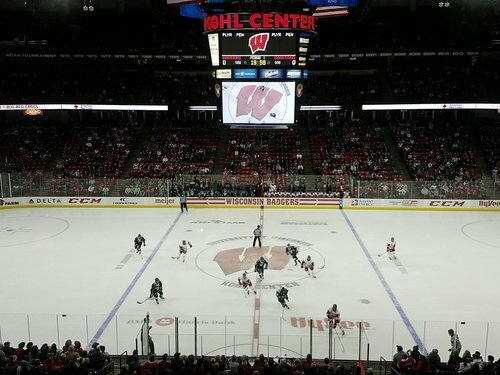 The University of Wisconsin men's hockey team continues Big Ten play with its first conference home series. Both teams are out for warmups. 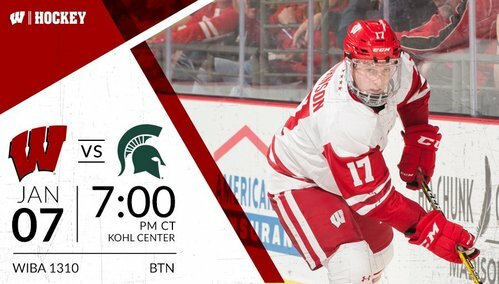 Badgers and Spartans are a half hour from getting started at the Kohl Center. Matt Jurusik in the net tonight for the Badgers for the first time since 11/19 knee injury. Ed Minney again for the Spartans. Faceoff in 6. #Badgers have taken the ice! 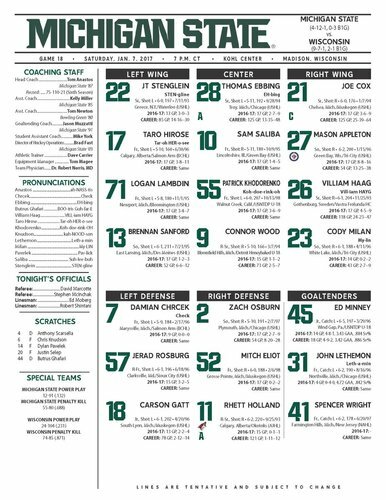 Starting for Wisconsin: Jurusik in net, Tischke and Linhart on defense, Frederic, Ford and Kunin up top ???? The Spartans & Badgers are underway at the Kohl Center. Jurusik makes the first save of the night for a stop 30 seconds in. BADGERS GOAL: Malone dings the iron and it goes in for a 1-0 UW lead 33 seconds into the game. 1-0 Wisconsin, 33 seconds into the 1st. #Badgers get it started right off the bat! @seamus_malone puts one past Minney for the lead. The second assist on Malone's goal gives Grant Besse an eight-game point streak. UW's Hurley called for holding, giving MSU the game's first power play with 18:09 left in the first. Hurley headed to the box for holding. Malone had the puck on another odd-man rush to get the Kohl Center crowd on its feet, but he's kept wide by the Spartan defense. SPARTANS GOAL: Gatt squeezes a shot from the goal line left off Jurusik's left pad and in. Reviewed and counted. 1-1 with 16:19 left in 1st. 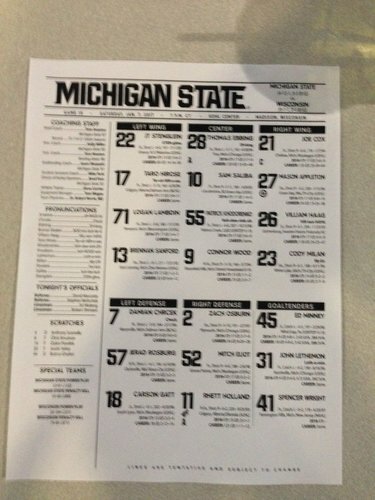 Carson Gatt gets his second in the last three games & it comes with 11 seconds left on an MSU PP. 1-1 with 16:19 to go in the 1st. Gatt slips the puck past Jurusik for the power-play equalizer. Jurusik looked good in stopping the Spartans' first four shots on goal, but the Gatt goal definitely wasn't a good one. First media timeout here at the Kohl. Shots on goal 5-4 in favor of Sparty. A #Badgers rush forces MSU to ice the puck in a panic. Hughes, Johnson and Wagner out to take a crack at Minney now.